After carefully proofreading your menu, add a menu to your cart from My Designs or from the Menu Maker. 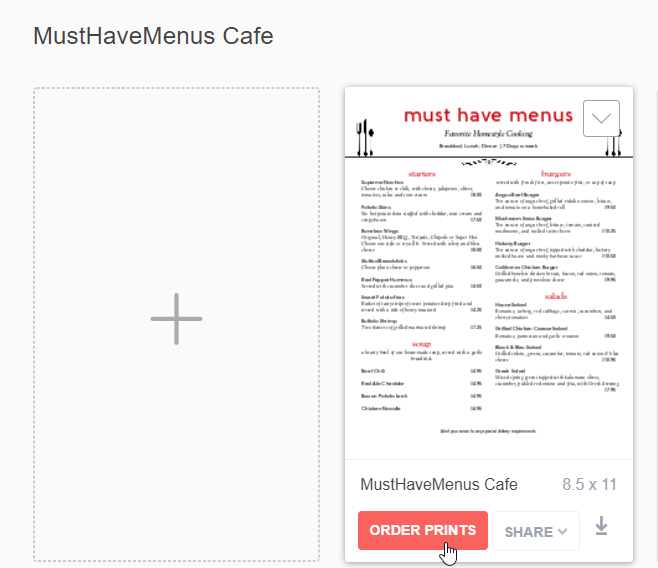 Click the order prints below your menu to proceed to checkout. Click Print located in the top navigation bar. Select a quantity and lamination option for an instant quote and delivery estimate before proceeding to checkout. Typically, orders received by midnight EST will ship the next business day by standard UPS Ground. An expected delivery date will display after providing a shipping address. You will receive an email with your tracking number once your order has shipped. Note: At this time, print orders are shipped only within the United States. We do not print A4 size templates.